Remember when Creative first launch the Creative Vado to compete against the Flip HD after the portable video cam gadget had enjoyed a large successful? Well, there's a 2nd Gen Vado HD ready for sale on 20th Sep 09 and it is Mac friendly. On 02 Sep 09, Creative announced the availability of the second generation Vado™ HD with new Vado Central™ for Mac OS X, which will feature video transferring and direct to iMovie importing of Vado videos. The new Vado Central will be available for download in early September and is compatible with all previous Vado and Vado HD models. 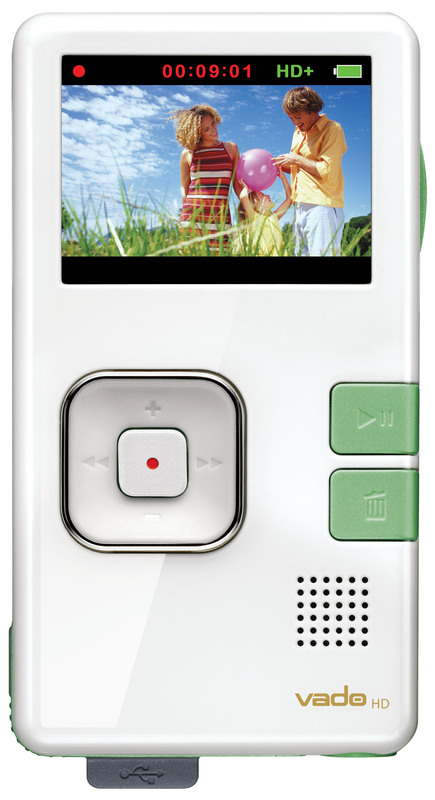 The new Vado HDs are available in two new color combinations, a 4GB glossy white with green accents, which holds up to 60 minutes of video and an 8GB glossy black with red accents, which holds up to 120 minutes of video. The Creative Labs Vado HD 8 GB Pocket Video Camcorder, 2nd Generation (Black Gloss with Maroon Accents) are available for pre-order starting today at www.amazon.com for $179.99 and $199.99 respectively. Vado HD 2 gen is identical to 1st gen except for the new colors and exterior - no spec changes at all that I can see. So I just picked up a Vado HD 1st gen - and downloaded the Free Vado Central software. For $105, it's like a 2 gen and works perfectly with Vado Central, iMovie 09 on the Mac! Great!